Finally. After a month of not baking, I just had to do something. I felt something was missing. I missed the smell of freshly baked cookies and the satisfaction of baking a batch of good brownies and so on. 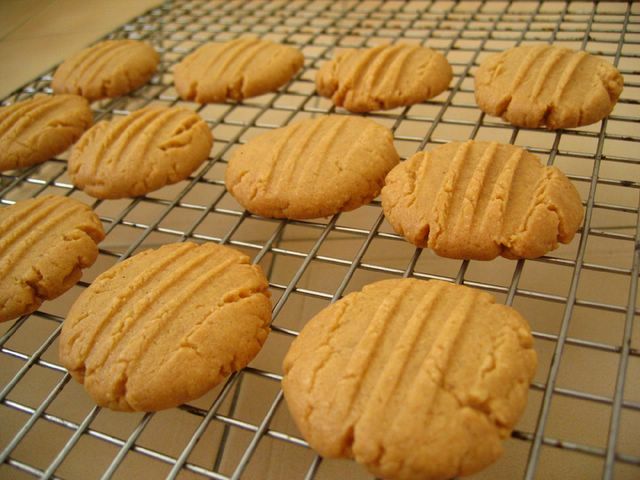 So during the weekend, I sneaked away from my books and went to bake something quick and easy – Peanut butter cookies. I know I did bake some a few months back but this time, I used a different recipe, one which required refridgeration. I thought it was pretty interesting and thus, gave it a go. 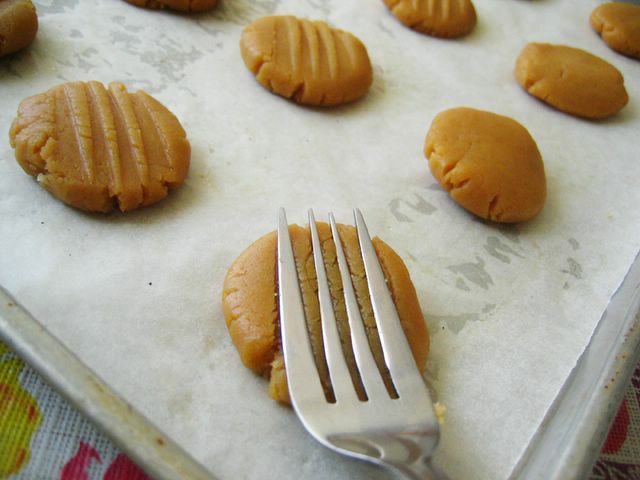 The end result was rather yummy – that is, if you love peanut butter as much as i do. I love the crumbly texture. It can be quite heavy (imagine how much butter goes in!) but I guess it was a timely bake, because I ran a half marathon (21.1km) two days ago and these cookies were perfect before and after runs… gave me all the energy I needed. that’s right.. all you need is a fork! cool huh? Anyway I love these cookies. Goes well with a hot cup of cocoa… Mmmm and I tell ya, the aroma of these cookies is to die for. Amazing stuff. Now, I am itching to bake some cupcakes using the Magnolia Bakery recipe! ahhhh… i can’t wait for the weekends… it’s now the only time i have to bake. I miss my freedom to bake as and when i can! 1. Preheat oven to 350°F. Generously butter two baking sheets. 2. Sift the flour, baking powder, baking soda and salt together; set aside. 3. In a large bowl of electric mixture combine the melted butter, sugars, peanut butter, egg and vanilla extract. Beat just until well blended. Add the flour and stir with a wooden spoon until combined. 4. Refrigerate cookies until dough is stiff enough to shape into balls, about 2 hours. Using a tablespoon scoop out dough and with wet hands shape into 1 inch balls. Place 2 inches apart of baking sheet. Using the tines of a fork or a cookie press lightly press on the ball of dough to slightly flatten and make an indentation. 5. Bake until bottoms are golden brown, 12 to 15 minutes. Let cookies cool briefly on the pans. Using a wide flexible spatula transfer the warm cookies to a rack to cool. *Taken from Williams-Sonoma Cookie cookbook. Your cookies seem to diefor! W’re hosting a brunch on Saturday and I’m going to make them! I like your blog very much! I am interested in baking these yummilicious cookies. But I don’t have a 1/3 measuring cup. How much is 1 1/3 cups of flour? I am new to baking.. just wondering if we should always use unsalted butter for baking cookies. Can salted butter do the work too? lazyg3r: 1 & 1/3 cups of flour is equivalent to 220g. hope that helps! anon: actually i don’t think it makes much difference. i actually used salted butter this time… and just omitted the salt that the recipe required. unless you’re baking ‘sweet’ cookies… it’s quite okay. I have just baked these cookies. Very nice indeed. Thanks for sharing the recipe! are they chewy or crunchy? miss: these cookies tend to lean towards the crunchy side. though you can tweak it. depends how long u leave it in the oven. it sort of also ‘melts’ in your mouth. something like shortbread. i think it’s cos of the high butter content? Just wanna check how long can I keep tis cookies?? The storage period?